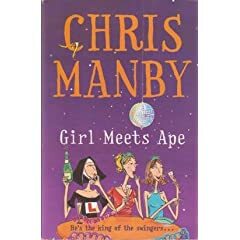 Girl Meets Ape by Chris Manby﻿ is pretty cool ChickLit novel. It’s not the best bur I think I enjoyed it. This is the only book I have read which written by Chris Manby. Its not those big comedy type chicklit novel but its more into light romance. He’s the King of the Swingers. But she’s the Ice Queen. When Dr Jennifer Niederhauser becomes head of the chimpanzee project at Prowdes Animal Sanctuary, the uptight young zoologist looks forward to making her mark in the conservation world. But the regime is ramshackle, the chimpanzees uncontrollable and her first meeting with head keeper Guy Gibson finds him naked and covered in baby oil. She decides never to work with animals or the childish again. But, she may not have a job for much longer anyway – Prowdes is in big financial trouble. Salvation comes in the form of a TV documentary. I think its an average or below if I have to rate the book. But the storyline is nice and simple. I was not bored reading it. Girl Meets Ape is a British chicklit novel which you can finish in a day. I have to stay story didn’t keep thing moving like at beginning of the book. I think this might be the reason readers might simply grade the book as not so good novel. I can’t blame them for that.